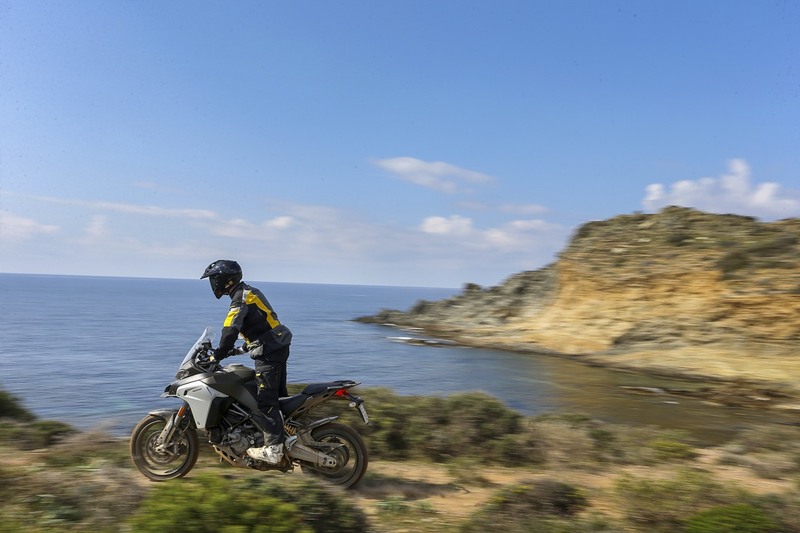 Real Riders: Ducati Multistrada 1200 Enduro Review, Would You Take It Off-Road ? 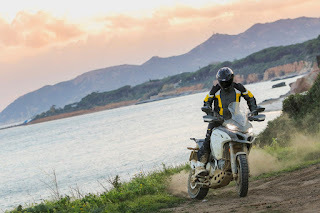 Ducati Multistrada 1200 Enduro Review, Would You Take It Off-Road ? A brief history of the Ducatis I’ve ridden: Nori Haga’s WSB bike, Michael Rutter’s JHP BSB bike, Hypermotards with Ruben Xaus, more Monsters than Monsters Inc, sportbikes from 916 to Panigale and my personal land-speed record holder from East Anglia to South Wales, the Multistrada. There are others but that’s enough. The point? Ducati are damn good at making bikes. Road or track, those Bologna boys and girls know how to bolt a bike together and make it work for a sport-minded rider like me. Take a Ducati off-road though? Frankly it is a bit like watching Arsène Wenger doing pitch-side keepie-uppie. He’s never dressed for it, his shoes are too shiny and it all looks awkward. You will excuse me then for pitching up in Sardinia for the Multistrada 1200 Enduro launch with a giant question mark stowed in my hand luggage: can Ducati make an Adventure bike? A true Adventure bike copes with any road, trail, speed and a passenger. 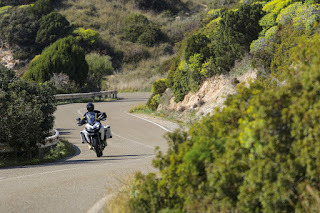 The Multistrada 1200 Enduro can already do this. What I really want to know is can I take this Ducati seriously in the dirt? We can dismiss immediately the myth that says the 1200 Enduro is a Multistrada with a bigger tank and knobbly tyres. Ducati made a big point of displaying the differences on the launch in Sardinia: new bodywork including aluminium side panels, strong spoked wheels, lowered gearing, changed offset and steering angle, stiffer conventional swingarm, increased wheelbase, raised suspension travel and ground clearance, 30-litre tank, smaller and higher-level exhaust, handlebars, adjustable rear brake lever and wider, grippy footrests. It’s quite a list and it evolved during four years development (in tandem with the Multistrada, but held back a year). Ducati claim 150,000km road testing, 40,000km around Porsche’s Nardo handling circuit and 10,000km off-road testing in Spain and Italy. If you sat on the Ducati Multistrada 1200 Enduro at one of the bike shows over the winter you may have felt it narrower between your legs by comparison, making it easier to sit or stand on. Standard height on the new seat is 870mm (850-890mm with optional seats) but that belies the slender midriff. Some Adventure bikes are either too tall or have a broad seat and it puts people off. My first impression is the Enduro’s more slender midriff will help more riders feel at home. With 50mm higher bars, grippier footrests (with easily removable rubbers) and adjustable rear brake lever to suit off-road boots, the Enduro is also a happier bike to stand on and ride off-road. As development rider Bepe Gualini puts it: ‘great attention was given to the ergonomics for the standing riding position as much as the seated long distance riding position.’ As a man with ten Dakars and 65 African rallies under his belt I’d say he knows a little about riding a bike in the standing position. Drawbacks are few, but I find one early doors. Rotating the bars and levers slightly forward for a better standing position you can’t see the road behind as well because the mirror stalk runs out of swivel. Maybe I’m too soft on the gear lever too but I found a neutral between every gear at one point or other during a day’s riding. The positives quickly add-up and I enjoy the multitude of settings and options available via simple controls and the intuitive, smartphone-like dashboard. And the Ducati Multistrada 1200 Enduro doesn’t need preferences resetting every time I turn the key. I’m also won over by the keyless ignition system. Out of preference I always switch off ABS, traction and anti-wheelie but if you really want to liven things up off-road try throwing 160bhp into the mix. How much power arrives at the back wheel depends on how much throttle you use of course, and the character of the Ducati Multistrada 1200 Enduro Desmo's engine is smooth enough within the lower reaches of the power curve to be rideable in full power mode on the dirt. But off-road it needs a steady hand and short gearshifts to keep it from either spraying the world behind you with roost or propelling you down a trail at epic speeds. The point is you don’t need 160bhp on a dirt trail. It’s a bit like a 1000cc sportsbike versus a 600 on a trackday. The litre bike might be mindblowing but the 600 is more enjoyable because you feel in charge and thrills are cheaper without the risks. The Ducati Multistrada 1200 Enduro engine presents itself to the throttle in such a linear way that 100bhp is easily the best setting for grip. Or not, if you’re as addicted to power slides as I now am. 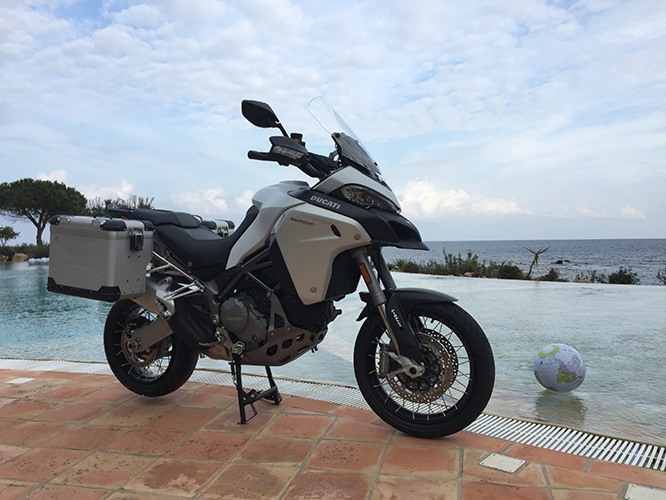 Chucking the Ducati Multistrada 1200 Enduro around in the Southern Sardinia hills is confidence-inspiring, the chassis happily holds lines or changes direction accurately depending on rider input. A bike which responds well to footpeg pressure is a bike that steers well. Off-road this is what you want: if you’re confident steering with the rear then having so much faith in the chassis and feel from the throttle makes power slides easy… ish! Few Adventure bikes let you play so readily without an occasional slap on the wrist. 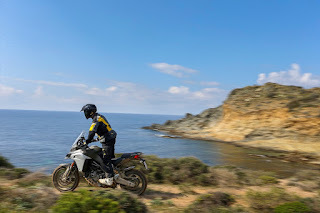 Usually weight bites you in the arse but the Ducati Multistrada 1200 Enduro, though heavier by 16kg (claimed dry weight) than the Multistrada, hides it well and it takes true dedication to the cause to end up in a heap. The role of the conventional swingarm shouldn’t be underestimated here. With 200mm taller suspension and my own preload settings dialled in (more on the rear than default ‘enduro’ mode) it dealt with most of the grief I threw at it. It cleverly knows when you do a jump too, softening for the landing. Not a bad trick. The swingarm is the Multistrada 1200 Enduro’s key says Gualini: ‘stiffness is the main point, it is much stronger and has an even spread of movement for the back of the bike. It is more linear which means better handling off-road.’ Clearly Ducati built this bike with performance, rather than marketing, in mind. We switched between road and off-road bikes during the launch, which meant a few minor changes including different tyres. Other testers on the launch were happier with Pirelli’s Trail IIs sharper effect on steering but I preferred Pirelli’s Scorpion Rallys because they made steering lazier, road or trail. I’m probably in a minority. Lower gearing is appreciably useful too. First gear is handy and ready to go at things, the clutch lever is light and needs less use to ride slowly. If you want to tackle something technical it’s better placed with revs and power too. In the same situation the standard Multistrada needs more clutch feathering and is harder work. A spiral multistorey carpark ramp, loading yourself onto a ferry or negotiating the Hardknott pass will all be easier with the Ducati Multistrada 1200 Enduro's gearing. 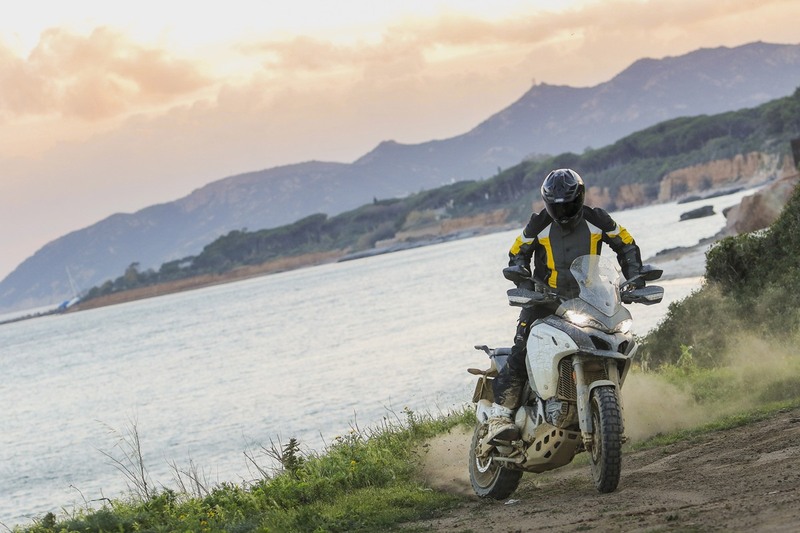 Ducati’s Multistrada 1200 Enduro rivals BMW’s GS, Honda’s new Africa Twin and KTM’s 1290 Super Adventure. 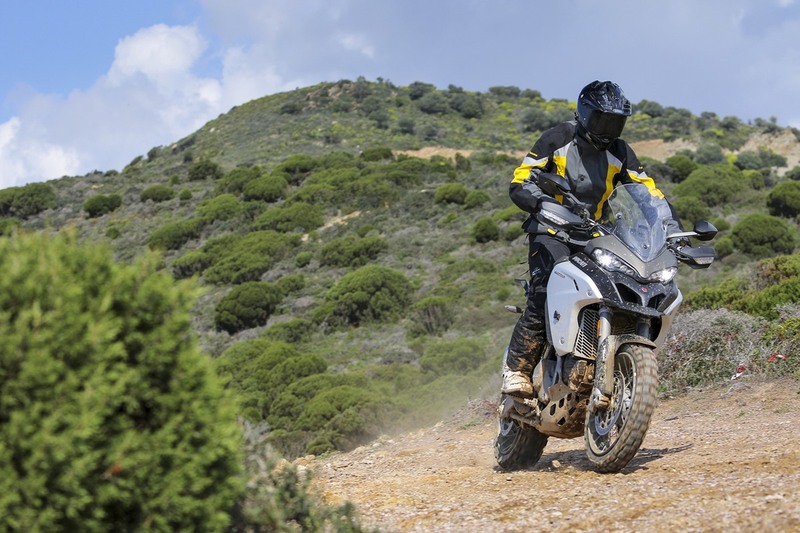 Triumph’s Explorer and Aprilia’s Caponord aren’t as developed off-road which drops them down the order. The 1200 Enduro sits in among the best – time will tell exactly where. Being a good Adventure bike means full-lock turns in your back garden, comfort and covering big mileages, and happily putting up with a giddy fool like me asking it to do power slides and wheelies. Or, in other words, treating it like a trail bike half its size and weight. Fit the Adventure bike bill? 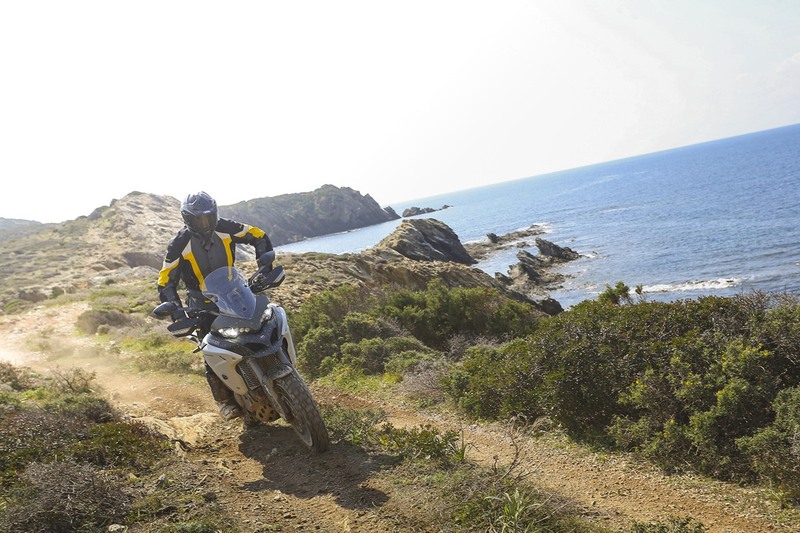 Ducati’s Multistrada 1200 Enduro emphatically does.